This is why I love The Onion. Do you see what I see? 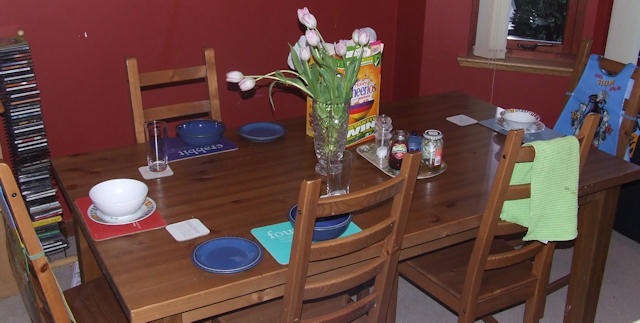 This is a photograph of our dining room, taken at 06:36 this morning. We invited Reuben and Joshua to choose which seats they would like, hoping that they’d chose the seats next to Jane and me (in this photo I have the blue ‘crabbit’ placemat, Jane has the turquoise ‘fouter’ one). But no, they wanted to be lords of the manor and sit at opposite ends of the length of the dining room table! Ah! they grow up so quickly.